Many companies refuse to face the reality that their businesses are in trouble or that their strategic positions are wrong. Whether a product line is no longer profitable, foreign competition has slowed growth, or technological changes have left them behind, many otherwise well-managed companies hang on for too long to the status quo. In this inflexible posture, managements time and talent go to waste, assets grow sterile, and technology falls behind. This book will help managers overcome the exit barriers that hamper strategic flexibility. Based on innovative studies of 192 firms within Sixteen industries, the ideas presented here are applicable to almost any industry and any type of firm. Harrigan discusses the major strategic decisions facing executives today, including guerrilla strategies of underdog competitors, entry and exit barriers, the use of joint ventures to cope with the uncertainties created by erratic growth, and the management of change. She focuses on the shortcomings of vertical integration, developing a framework for better make-or-buy decisions. The effects of exit barriers on firms' strategic flexibility are detailed, and managerial tools to cope with high barriers and declining businesses are introduced. 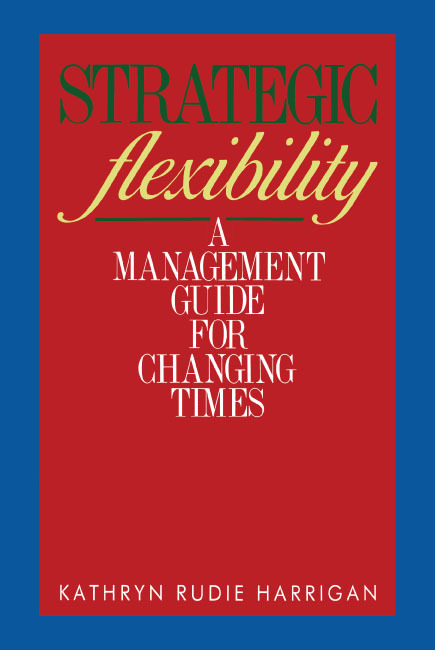 Strategic Flexibility is organized to provide easy reference for managers seeking to find out what strategies have worked and why. This book offers practical, proven ways for managers to expand the flexibility and responsiveness of their companies to new competitive conditions. Entering a mature industry is seldom expected to be easy because early entrants have already defined competitive norms. Moreover, entry barriers, a key determinant of the attractiveness of an industry, may be relatively high (Porter 1980). Knowledge of the nature of entry barriers can be helpful in suggesting whether the strategic window of market opportunity is open (Abell 1978). (When the window of opportunity closes, an industry loses its attractiveness as a candidate for entry.) The costs of overcoming some entry barriers are so high that they exceed the benefits of successful market penetration (Bain 1956; Bass, Cattin, and Wittink 1978; Ornstein, Weston, and Intriligator 1973; Scherer 1980). Yet firms, if they understand how entry barriers work, may not only pay the price of entry but also invest further to insulate themselves from subsequent penetration by new and sizable firms. What is needed is a framework for evaluating markets that firms might enter, particularly to avoid wasting resources by trying to overcome a lethal combination of high entry barriers and competitors' resistance. Preentry analysis of these barriers might prevent firms from committing resources to battles that cannot be won cheaply. This chapter reviews the theory and evidence supporting the existence of entry barriers. It proposes a new way of thinking about them in the context of mature manufacturing industries. Studying entry barriers in mature industries is particularly interesting because these environments are widely assumed to be inhospitable to enter. Yet entry does occur, and firms have prospered by entering the right mature industries. Thus it seems that a discussion of entry barriers would be of interest to outsiders looking in as well as to ongoing firms that seek to keep outsiders out. Entry barriers are forces that discourage firms from investing in a particular industry (or niche of an industry) that appears attractive. Because entry barriers can represent substantial disadvantages for many types of potential entrants, they suggest that higher-than-average profits may be difficult to attain, not only as a result of size or timing advantages enjoyed by existing firms but also as a consequence of the willingness of these firms to lower prices to the limit price (that is, to the price level that will limit new entry) in order to discourage other firms from trying to enter (Collins and Preston 1969; Gaskin 1971; Spence 1977, 1979). Industries characterized by such high entry barriers have generally been considered to be more profitable in the long run (Bain 1956, 1972; Modigliani 1958; Stingier 1958) and increasingly have become the targets of those large domestic firms or foreign entrants that can afford to overcome such entry deterrents (Gorecki 1976). High entry barriers are a necessary but not sufficient condition for long-term industry profitability. The steel industry, for example, possesses extremely high capital barriers, yet is only marginally profitable. High entry barriers are necessary because without them, plant expansions (a strategic investment that is difficult to reverse) could rapidly outpace demand. The pressures created by underutilized plant capacities precipitate price wars, which may drive out some firms (provided the exit barriers they face are low; see chapters 6, 7, and 8) but will surely ruin profit margins for all (Chamberlain 1962; Fellner 1949; Vernon 1972). The presence of one or more other unattractive traits -- high exit barriers, a fragmented structure of nonhomogeneous firms, commoditylike product traits, or other unfavorable characteristics -- all reduce an industry's profitability potential, as in the case of steel. Mature industries are those that generally grow slowly (less than 10 percent annually in real terms), where demand is frequently inexpansible, and where product traits are generally familiar to consumers or users. Although technology may have been stable within mature industries, process innovations and new technological configurations could compete alongside the relatively aged (and frequently capital-intensive) assets that populate such industries (Utterback &amp; Abernathy 1975). Although competitive structures usually remain stable in mature industries, there have been cases where a newcomer's entry changes the old structure, as in the example of Hanes's pantyhose strategy. There may be several market segments within an industry where a potential competitor might gain entry. The abilities of some industries to sustain different competitive profiles as a result of the needs of these customers provides the foundations of the notion of strategic groups (Caves and Porter 1977; Hunt 1972; Newman 1978; Porter, 1979b; see chapter 2). Note that these various market segments will not be equally desirable to serve because they are not equally profitable, and that they will not constitute a market niche unless the firms serving them are protected by entry barriers from invasions by outsiders. Thus the market segments that are easiest to enter will be the least attractive. They will offer an initial entry point for firms that cannot afford to invade the oligopolistic core (that is, the market niches often dominated by the top four firms). Strategic groups are firms that embrace the same strategies for serving customers; their competitive postures are similar. Although the number of strategic groups is probably fewer in maturity than when the rules for successful competition were yet unestablished, differences among competitors exist and are relevant when evaluating opportunities for entry. (Chapter 2 expands on this idea. It is developed here briefly because it is germane to assessing entry-barrier heights.) The most successful strategic groups are sometimes called core competitors because they serve the most attractive core of customers. Core competitors are generally believed to possess substantial market power as a result of their relatively large market shares. Acting collectively, core competitors can influence prices and behaviors in their markets. Frequently their rate of return is higher than that of fringe competitors who are not protected by niche boundaries. Because new entrants are less likely to enjoy scale economies or advantages of experience initially, they are most likely to hover on the less profitable fringes or periphery of industry influence until they can penetrate the core successfully. Although new firms more frequently occupy the fringes of a competitive landscape, some late entrants do eventually make significant inroads to the core of competition. Among these firms, process innovations are particularly likely to be their ticket to capturing substantial market share. Because firms operating the conventional technologies of a mature industry are more likely to be far down existing experience curves and would have exhausted the cost-saving benefits of many easy operating innovations, new firms seeking entry would be more likely to introduce radical process innovations. The theory of entry barriers (and their implications for managers) is reviewed next. Construction of variables approximating these forces is presented in appendix 1A. These techniques for assessing industry attractiveness may be helpful in identifying acquisition candidates or in assessing whether an industry appears attractive to outsiders. In mature industries, the most important influences on entry behavior are (1) technical factors and (2) competitive conduct variables. Technological factors include: (1) capital requirements; (2) scale economies; (3) the age of an industry's productive capital (physical plant and equipment); and (4) the balance of labor intensity to capital intensity predominant in an industry's technology. Competitive behavior variables include: (1) previous entries; (2) changes in the dispersion of market shares; (3) industry advertising and research and development (R&D) outlays; and (4) average levels of excess productive capacity. Firms can influence the heights and natures of some entry barriers, but they cannot affect others (those relating to demand and other exogenous factors such as technological scale) except indirectly by their investments. This distinction is useful in noting how managers could use their knowledge of entry barriers as a competitive weapon. Mature industries can be penetrated if entrants obtain superior operating economies through improved technologies. Changes in capital-to-labor ratios and minimum-efficient-scale (MFS) factors could provide the necessary edge. Alternatively, the key technological advantages needed for entry may be newer physical plant and equipment, or meeting large capital requirements. Capital-to-Labor Ratios. Industries where existing firms' technologies are already relatively capital-intensive offer fewer opportunities for fringe firms to enter than those that are labor-intensive. The introduction of labor-saving technologies offers opportunities for fringe firms to attain lower operating costs, as well as licensing revenues for their technological innovations. Capital Requirements and Technological Scale. Capital requirements have long been identified as entry barriers (Bain 1956), and they were expected to act as entry barriers for fringe firms in the study. The technologies used to produce the goods of various industries each possess scale economies -- that is, plant sizes where, if fully utilized, average unit costs of production will be lowest. Potential entrants would be obliged to enter at this large scale in order to avoid incurring significant diseconomies (Scherer 1980). (Moreover, demand would be satisfied by existing plants in a mature industry unless the market is growing rapidly.) Erecting a new plant would be tantamount to challenging the ongoing firms to a price war in a slow growth environment. Accordingly, the potential entrant must assess its willingness and ability to absorb losses from such warfare until its new plant has been established in the industry. Firms with ample capital could afford to buy their way in. Other fringe entrants could not. Age of Physical Plant. The presence of new physical assets can indicate a recent change in an industry's technologies, or several recent entries. If the vintage capital of an industry is relatively new, it may indicate that an unsettled market opportunity exists. Thus relatively new physical assets may indicate an environment where entry may be more successful. Although the cost of acquiring assets for manufacturing products that are subject to frequent style changes may be high, the most specialized -- hence inflexible -- forms of these assets will quickly become vulnerable to obsolescence (Menge 1962). This means some industries characterized by increases in the newness of physical plant (a seemingly attractive attribute) would also be subject to high exit barriers, an unattractive industry trait covered in chapters 6, 7, and 8 (Porter 1976b; Caves and Porter 1977; Harrigan 1981b; 1982; 1983a). Absolute Cost Strategies. Fringe competitors (or potential entrants) seeking sizable shares of their market are most likely to attain success through process or product innovations. Both are strategies that require fringe firms to overcome entry barriers based on absolute cost advantages, a strength originating from access to scarce resources that new entrants cannot develop as inexpensively as earlier entrants did, if at all. Examples include access to distribution channels, ownership of a uranium mine, or other factors that would be more costly to replicate when entering late. This cost advantage would be due in part to inflation and in part to the limited nature of the resources possessed. New entrants would be obliged to spend heavily in order to match the access to scarce raw materials, vertical relationships, or patents that constituted these advantages. Although some experience-curve advantages can be replicated through accelerated spending programs, a few cannot be copied by late entrants, except by acquiring existing firms. Study of an industry's history often suggests patterns of competitive behavior that act as entry barriers to outsiders. Most prominent among these is evidence that demand is satisfied adequately by ongoing firms. Changes in Market Shares. High variability in market-share changes indicate firms are jostling for position. An outsider should expect competitive conditions to be volatile where market shares change frequently and substantially. Sizable changes in share (relative to average industry market-share changes) suggests that some competitors are pursuing growth objectives. Since market-share points are quite difficult to gain in mature industries, the presence of large relative changes should signal a volatile environment, which discourages entry. Moreover, firms possessing high market shares enjoy relative cost advantages (as a result of the distances they have traveled down the industry's experience curve). New firms entering this type of environment would be less likely to succeed unless they can insulate themselves from these cost pressures by exploiting a technological innovation. Excess Capacity. Firms that already hold a stake in the health of an industry will erect protective barriers around their markets. If they are highly determined to do so, they may even hold a portion of their own plant capacity idle as a warning against entry, thereby signaling their willingness to fight a war of attrition to prevent entry (Esposito and Esposito 1974; MacMillan 1980). Although evidence of recent successful entry by other firms might encourage potential entrants, the presence of several underutilized plants should deter yet another firm from entering. Building capacity in anticipation of demand has been a particularly effective method of shutting out new entrants -- as antitrust courts have noted since the ALCOA decision of 1947 -- and this tactic is still attractive in mature industries. High levels of excess capacity should discourage new entry, especially if history suggests existing firms cut prices to fill their underutilized plants (to lessen the substantial cost disadvantages of excess capacity). Market share will be difficult to capture in such settings, and losses will be high if outsiders try to enter when excess capacity is high. Advertising Expenditures. Firms can make investments in entry barriers through physical plant, R&D, advertising and other assets to discourage new firms from following them into an industry. They can hold outsiders at bay, largely by dint of pricing pressures but also by virtue of absolute cost advantages. Entry barriers erected through advertising and R&D can be ephemeral, however. Outsiders that possess ample cash reserves could hurdle many such barriers to reap the benefits of early entrants' missionary advertising, product introductions, or engineering breakthroughs. In short, successful performances may attract well-endowed entrants who can scoff at these forms of entry barriers. Outsiders could enter a mature industry by creating demand for a branded product. If products are not yet commodities but their markets are mature, however, it is likely that buyer loyalties favor incumbent firms. The product is older, consumers are better informed of its attributes, and many ways of differentiating existing products have already been employed. Product innovations could permit entrants to challenge the core of industry competition (and seize large market shares) if their product is truly something new. Measurement of product differentiation is a problem, however. A useful measure of this critical phenomenon has not yet been developed in industrial economics. Yet the implications for competition within environments where products can be differentiated (as compared with environments where products are commoditylike) are critical when evaluating whether entry should be attempted. Tactics such as branding, advertising, quality variations, and other differentiating maneuvers might be employed effectively to dominate a desirable market segment within noncommodity businesses. But the cost of building a niche is substantial. Firms desiring to do so must be able to withstand the several years of losses required to erode the barriers that successful firms have erected to gain entry. In this context, the advertising expenditures fringe firms must make to overcome the customer loyalties attained by ongoing firms (a variable that is measurable, although it is scarcely a global estimate of product differentiation) may approximate the product-differentiation entry barrier. If high advertising expenditures are indicative of an environment where many different configurations of a product could satisfy customers' needs, they also suggest that some competitors (representing a particular strategic group) have been supported in these expenditures by the market's response. High advertising outlays could indicate a market opportunity for firms that can afford the cost of advertising campaigns. This argument parallels that in Menge (1962), which says that, although the high cost of frequent style changes should reduce the absolute number of competitors and deter entry, the opportunity to satisfy diverse consumers' preferences could permit several firms to occupy modest but specialized market niches. R&D Expenditures. Research and development outlays offer the first path to penetrating the established market positions of earlier entrants. In order to match patents or licensing advantages enjoyed by leading firms, potential entrants must spend heavily on R&D to obtain new skills or draw on research skills developed for other industries (Kamien and Schwartz 1975; Mueller and Tilton 1969). Despite formidable entry barriers, firms will try to penetrate mature industries if demand appears attractive or leading firms are enjoying high levels of return on investment (ROI). Rapid growth in demand within otherwise mature markets will attract new entrants. New firms will be attracted to industries where there appear to be opportunities to enter easily and earn acceptable profits. The more attractive candidates for entry would be those industries where growth in demand is outpacing ongoing competitors' abilities to satisfy it (for example, where excess capacity is low). If leader firms have enjoyed high rates of productivity and have made effective use of their assets, some spillover or halo effect might be shared by follower firms, given an environment where lead firms' technological improvements and other innovations can be emulated (after a lag) by follower firms. This form of success attracts new entrants. In summary, high levels of ROI and growth in demand encourage potential entrants to invest, as would high levels of industrywide advertising. Firms could discourage tentative entrants by building additional plants before ongoing plants are fully utilized. Firms evaluate entry decisions within the context of a national economy as well as in light of competitive dynamics with an industry. Entry is more likely to occur during periods of increasing incorporations and less likely (after a lag) during periods when high numbers of business failures occurred. Rapid increases in economic price levels (signaling higher costs) depress profitability, particularly within those markets where severe price competition makes increasing operating costs more difficult to pass on to customers. Tests of the relationships between entry-barrier heights, rates of entry and performance are described in appendix 1A. Results will be discussed. In table A-1 in the appendix, negative signs indicate forces that acted as entry barriers; the raised letters indicate their levels of statistical significance. These included excess capacity, high technological scale, and entry by other firms (for detailed discussion of these and other results, see Harrigan 1981a). Advertising and R&D expenditures have positive signs, suggesting that differentiable products offer more attractive environments for investment than industries with commoditylike products. These conditions encourage entry by outsiders. The ROI variable turned positive when it was lagged an additional year, suggesting that outsiders cannot respond quickly to favorable signs within mature industries. Results concerning the excess-capacity variable suggests an interesting dilemma. Failure to operate plants at engineered capacity within industries where scale economies are significant will incur costly diseconomies. Yet the decision to operate those plants near their engineered capacities appears to encourage potential entrants to construct additional plants, which they will then, predictably, set out to fill through price cutting. Depending on expectations concerning future demand for the products of the line of business in question, ongoing firms must elect whether to act in a manner that reduces their own short-term or long-term profitabilities. If the industry in question is a mature one, it would appear that some reduction in attainable profits would be necessary to reduce the potential volatility that could occur if severe excess capacity were allowed to develop through the entry of a new firm. In table A-2 in the appendix negative signs indicate conditions that reduce ROI, and the asterisks indicate levels of statistical significance. Excess capacity and high R&D expenditures are among the forces that reduce an industry's attractiveness to outsiders. ROI performance appears to be higher where concentration is high and firms' past performances seem to be fair indicators of future ROI, a finding that would be expected within professionally managed firms whose executives are well aware of the importance of well-managed financial statements. Exits by competitors do not appear to help remaining firms' ROIs in this sample. As chapters 6, 7, and 8 suggest, exit is a complex factor, whose effect depends on industry traits as well as on the behavior of the other firms within that industry. Results tend to suggest that technological variables are the more difficult to overcome by firms contemplating entry. All potential entrants must invent a means of hurdling technological barriers when pursuing a new line of business; hence all face similar needs for the capital required to inaugurate productive or distributive assets. The common aspects of the entry-barrier problem have been illuminated in the results presented. No attention was devoted to the important differences among competitors within an industry after these commonalities have been overcome, however. The common entry barriers may be likened to the term in the equations of portfolio-valuation models. The risks of assuming a specific strategic posture that may be strongly correlated with the strategic postures of ongoing competitors may be compared with the b coefficient, much as capital-asset pricing models consider covariance among securities. Following this analogy, results suggest that the value or long-term performance of the firm (which is the embodiment of its strategy) reflects the investment decisions the firm has made there in common structural assets, plus investments in unique strategic-posture assets that may (or may not) overlap the strategic postures of competitors. Entry barriers are of different heights as they protect the strategic postures of firms occupying diverse niches of the market (or serving the same customers using differing postures). If, as results suggest, capital requirements alone are not adequate entry barriers, then ongoing firms might aggressively shift their capital-to-labor ratios in favor of more efficient, technologically innovative assets. Results also suggest frequent improvements in manufacturing technologies (new assets). Results indicate that conditions of excess capacity and a history of price cutting to fill that capacity are formidable deterrents to entry by outsiders. Thus the generally held theory that price wars and excessive idle capacity offer strong negative signals for potential entrance has been confirmed. Results also suggest that firms could further barricade their portals by investing in R&D effective (1) to increase technological scale economies within their respective industries or (2) to force their industry's structure to evolve in a manner that would make subsequent attempts at entry even more ineffectual. Adherence to alternative (2) poses an interesting public-policy dilemma. Firms whose R&D efforts force industry standards to be redefined and drive the progress of innovating behaviors will improve the general level of consumer welfare at the cost of ever-steepening entry barriers. Such behavior suggests scenarios of increasing concentration (as marginal entrants are rebuffed by towering entry barriers) where entry can be successfully undertaken by affluent, diversified firms possessing (l) the staying power to survive a protracted war and (2) the perspicacity to offer innovations of sufficient value to force the industry's structure to evolve in a manner that favors them. Results suggest that potential entrants are less likely to attempt entry where they expect little chance for success. If a market is already suffering excess capacity, firms may be discouraged from entering. This finding suggests that defending firms might adopt a policy of keeping some level of capacity idle by always building first and in the most appropriate locations to preempt would-be competitors (see Dixit 1980; Rao and Rutenberg 1980). Finally, if, as results suggest, the recent entries by competitors act as high barriers against subsequent entry, then defending firms should give some thought to the selection of those firms they might permit to enter. Some competitors are preferable to others for their different competitive styles (which can be observed by studying their behaviors in other industries). Ongoing firms might control the profitability of their industries by making entry especially difficult for the types of firms they would prefer not to admit. Excess capacity is a malevolent type of barrier that could explode into price warfare (and create an unpleasant exit barrier later) if it is not controlled properly. A policy of raising customers' expectations for service, variety, and quality may be more appropriate than creating excess capacity as a way to discriminate among candidates for entry. Raising customer expectations moves products further away from commoditylike status. Results suggest this type of defense is more effective in deterring entry than is merely raising capital requirements. Forcing innovation could lead to patented process improvements (cost leadership), savings from scale economies, and other types of entry barriers that are more controllable than those created by excess capacity. For aspiring entrants, results, suggest that firms that are determined to keep new firms out would be more effective in focusing their competitive responses, rather than emphasizing the structural traits of their particular industry. Devoting substantial budgets to maintaining trade relations, improving delivery and customer service, or other forms of marketing may be a more effective means of shielding market niches from entry than others -- for example, where industry marketing expenditures have been generally low. If ongoing competitors focus defensive actions on structural traits, informed entrants that recognize this discrepancy and exploit it may ease into an industry without setting off price wars or incurring other significant forms of resistance. In summary, results suggest firms could use excess capacity (created internally or by admitting new competitors) to discourage potential entrants. Given the difficulties excess capacity might create, however, other factors might do instead. If there are outsiders that possess the needed capital and can afford to make the appropriate investments to enter, ongoing firms would do well to monitor fluctuations in scale economies, capital-to-labor relationships and other competitive investments in order to assess whether the strategic window of opportunity is open too wide. Measures of entry barriers are difficult to construct in a manner that will be useful to strategists contemplating entry. Yet such estimates are crucial in assessing the relative attractiveness of those lines of business strategists hope for their firms might undertake successfully. The entry decision in this study considered the likelihood of successfully entering into an industry de novo -- that is, as a new competitor, not by acquiring an existing industry participant. The dependent variable denotes whether entry occurred within a particular industry in a given year. Entry was deduced by counting the firms listed in Dun &amp; Bradstreet indexes and corroborating that count with Census of Manufacturers reports of firms in operation. Entry was indicated as a binary code (where "1" indicated entry occurred). Table A-3 in the appendix summarizes the traits that approximated entry barrier heights and enticements to enter. Details concerning their construction appear in Harrigan (1981a). These tests develop variables by drawing on a number of data sources to improve on the foundations of the economic theory. The early studies of entry barriers were inconclusive, yielding ambiguous results. An example of these models is presented in table A-4 in the appendix using the same dependent variable and data of table A-3, and independent variables suggested by these earlier economic studies. Its results are poor. The R2 (coefficient of multiple determination) is quite low (.0200), and the value of the intercept term (.494) in table A-4 approximates closely the actual mean value of the dependent variable (.500), suggesting the independent variables add relatively insubstantial information to predictive power of this model. More meaningful models were needed when the precepts of this topic were translated into questions of interest to scholars of strategic management. Transformations were made for corrections of the heteroscedacity, serial correlation, and lagged structure. The observations used to test the models that follow spanned a decade (the differences of nine intervals). These were pooled (and corrections made) to yield a total of 540 data points. In time-series specifications that are pooled with cross sections, the residual is assumed to be composed of a time-series error, a cross-section error, and an interaction effect. Transformations are required to correct for autocorrelation, and special interpretation of the error term is needed. Moreover, the pooling of data describing heterogeneous-sized firms required generalized differencing corrections using weighted least-squares estimates to obtain the appropriate error term (see Bass, Cattin, and Wittink 1978; Hatten 1974). Complete explanations of these procedures appear in Harrigan (1981a). After corrections, there was relatively little serial correlation in the models estimated (as indicated by the Durbin-Watson d-statistic); and the correlation coefficients of the absolute values of the observed residuals to the predicted values of the dependent variable were quite low, which suggests that the variance of the residuals generated by this process does not depend on the values of the independent variables (see Balestra and Nerlove 1966). A lagged structure (of one year in most cases) was imposed on the models tested to reflect the assumed reaction time necessary before firms could convert liquid assets to capital goods and production capacity following industry-performance stimuli. The lag structure is a fundamental element of this model because specifications that allow entry to occur during the same period as the impetus encouraging entry violate the basic assumptions of a nonfrictionless environment, where assets are not completely flexible and not immediately available. The models that explained the greatest amounts of variance in entry behavior and firms' performance are of the general form presented for the entry model that follows. In each, the error term of first-stage analysis provided pi, the correction term.